Five years ago today (12/2/13) Marriage Equality went into effect with midnight ceremonies at the Waikiki Sheraton’s Leahi Club. 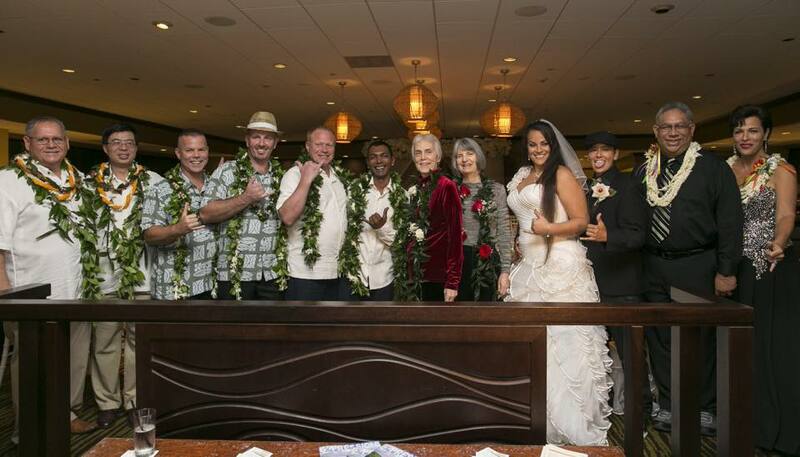 At a midnight a community ceremony co-sponsored by the LGBT Caucus of the DPH a total of 37 couples tied the knot thanks to the generosity of the Waikiki Sheraton and the hospitality of then General Manager Kelly Sanders. We hope that each and everyone of you will take a moment today to celebrate and to honor this huge step forward in the fight for justice and equality. how everyone was impacted by this amazing feat. As the LGBT Caucus has shown since 2013 (i.e. passing the transgender birth certificate law, banning conversion therapy & our 2019 Legislative Priorities listed below) we all still so have so much more left to do to ensure justice and equality is a reality for everyone. So we hope that you will think about making a donation to the LGBT Caucus so that we have the resources for the battles ahead. Reminder December LGBT Caucus Meeting is set for December 15 at 10 AM and it will be a panel discussion about changing the LGBT Caucus’ name to SOGIE (Sexual Orientation, Gender Identity and/or Expression). Panel members to be announced soon. If you missed Be The Change: Becoming a Foster Parent you can watch the video by clicking here.